Police, at least one with a rubber bullet gun, confronted protesters Sunday night near the Standing Rock Indian Reservation, outside Cannon Ball, N.D.
Williams College held a small prayer service Tuesday night for a recent graduate who was severely injured early Monday during a violent clash between North Dakota law enforcement and demonstrators who were protesting the Dakota Access Pipeline. About 15 people attended the gathering for 21-year-old Sophia Wilansky at the liberal arts college in Willamstown, according to a spokeswoman. Wilansky’s family and supporters say she lost a part of her left arm during the incident Monday morning. Demonstrators and the family of Wilansky, of New York, provided an account of the weekend violence that differed sharply from the statements of law enforcement. A New York woman faces multiple surgeries and could lose an arm, her father said Tuesday, and protesters and law enforcement gave conflicting accounts about what might have caused the explosion that injured her. Wilanksy’s father, Wayne, said Tuesday that his daughter was hurt when law enforcement personnel threw a grenade at the unarmed protesters, a claim echoed by the Standing Rock Medic & Healer Council, a group supporting the ongoing demonstration. She was listed in serious condition Tuesday at a Minneapolis hospital. 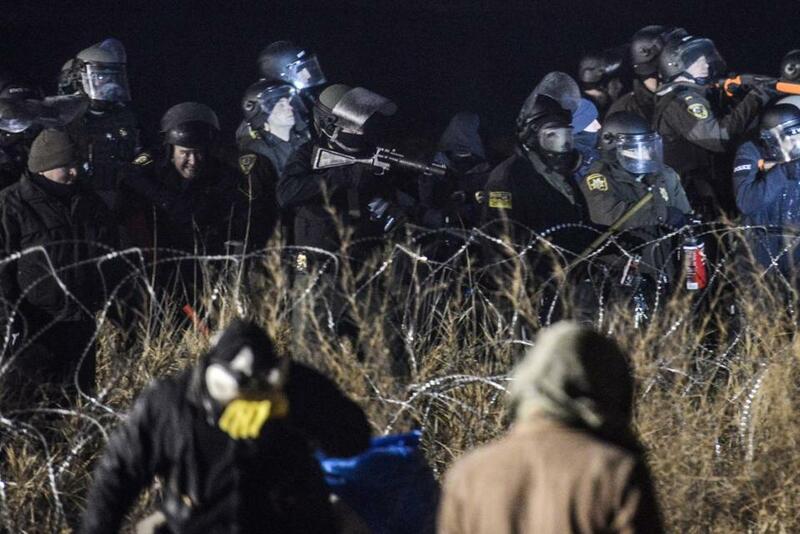 But the Morton County Sheriff’s Office says authorities did not use concussion grenades during a clash late Sunday and early Monday near the camp along the pipeline route in southern North Dakota. Sheriff Kyle Kirchmeier told reporters during a briefing Monday that officers were forced to deploy water hoses and pepper spray to quell the protesters, who he said threw projectiles including rocks and burning logs at police. One officer was struck in the head with a rock, he said. Authorities said police spotted demonstrators with cylinder objects that may have been rigged with explosives. 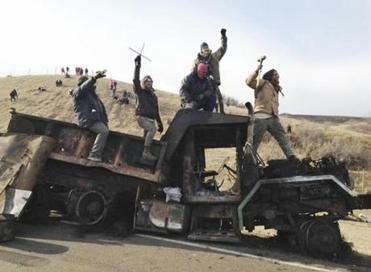 “It was at this time an explosion occurred and several protesters ran to the area, pulled a female from under the burned vehicle, and fled the scene,” the North Dakota Highway Patrol said in a statement. Demonstrators contend that more than two dozen people were seriously hurt and hundreds of injuries were documented, but the precise number of wounded could not be independently corroborated. The $3.8 billion pipeline to carry North Dakota oil to a shipping point in Illinois is largely complete outside of a stretch under a Missouri River reservoir in North Dakota near the Standing Rock Sioux Reservation. The tribe and others have been opposing the construction for months, saying the pipeline threatens the tribe’s drinking water along with American Indian cultural sites.